Bake-Off, X Factor, Bromans… it’s no surprise that people in the UK love TV. Viewers are increasingly spoilt for both choice and quality, as traditional broadcasters, streaming services like Netflix, and import focused channels such as Sky Atlantic, give us access to a “golden age” of content. Far from being killed by the internet, a combination of both traditional and online services, has enabled our love of the original Gogglebox to evolve and continue. On average, we watch three hours and 32 minutes of television a day, according to data published at the end of the summer by the communications regulator, Ofcom. 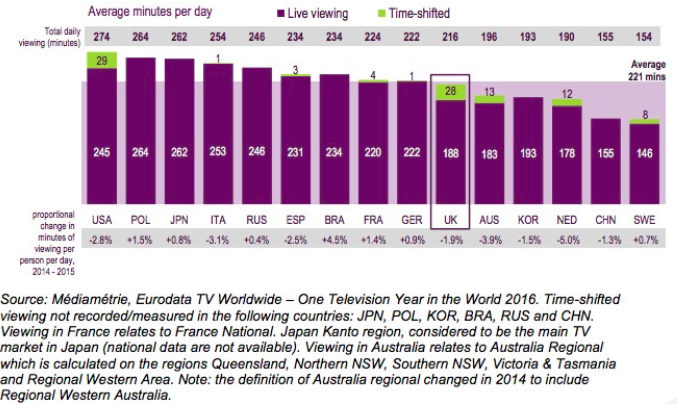 In that study, daily TV viewing was highest in the United States (274 mins a day) and lowest in Sweden (154 mins). Broadcast TV still reaches 91% of TV viewers on a weekly basis. 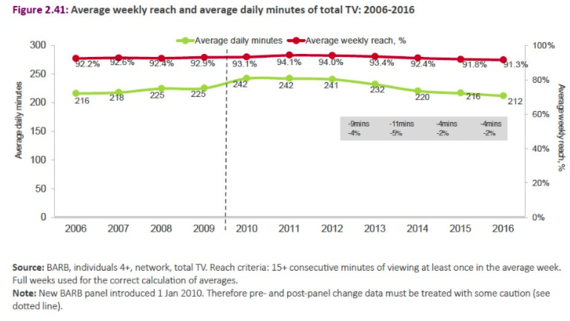 Amazingly, average daily viewing hours remain almost unchanged from a decade ago (212 mins in 2016 vs. 216 mins in 2006). TV remains a medium with the ability to bring people together, especially around major events. Sports like the Olympics or the football World Cup, breaking news, Christmas specials or a Bake Off-final (nearly 15 million people, tuned in to watch last year’s final, before the show moved to Channel 4), can still reach large audiences. According to Ofcom, more than half (58%) of people in the UK identified a preference to watch major national events live – as opposed to on-demand – due to the fact that other people across the country are watching at the same time. Another area which has stayed surprisingly consistent is the audience share of the main public service broadcast channels (BBC One, BBC Two, ITV/STV/UTV, Channel 4 and Channel 5). In a multi-channel era (the UK government turned off the analogue TV signal in 2012) audiences have more choice than ever. BARB (the Broadcasters’ Audience Research Board) now captures audience data for 328 TV channels in the UK. Yet the old TV channels 1-5 still enjoy 51% of audience share; a figure that hasn’t changed in four years. Once additional portfolio services (think ITV2, +1 services etc.) from these broadcasters are added into the mix, then the UK’s public service broadcasters still enjoy more than two-thirds of total TV viewing. Yet, these figures can mask discernible changes in our media habits. For many younger audiences, TV viewing is often more akin to radio – used as background noise – as mobile devices increasingly being the primary focus of our attention. The idea of the family viewing time is moribund, a nostalgic image of a bygone era. On any given day, less than a third (30%) of people sit down with their family to watch the same program together, as the viewing experience becomes increasingly fragmented. Young demographics are also much more likely to view TV-like content on YouTube, use a subscription service (like Netflix or Amazon Prime), and binge watch new – of their favorite – shows. All of which means they’re watching less traditional TV. Ofcom’s research found c.10 million Britons, 32%, have lost sleep or are tired the next day due to staying up too late binge-watching TV, but increasingly this is content being streamed over the internet. With BBC, Sky and others all offer “online boxed sets” there’s less need to own physical copies of your favorite shows. 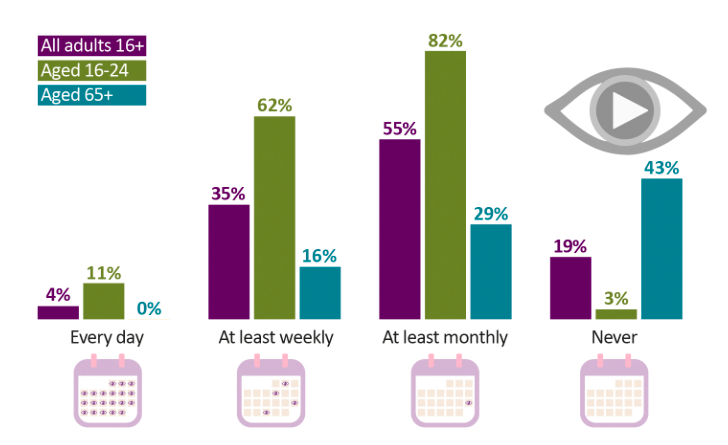 As a result, just 63% of UK households now have a DVD player, down from a peak of 85% in 2012. Ownership levels are now lower than they were a decade ago (67% in 2007) as Smart TV’s, internet connected dongles and other streaming services make this format – for many households – increasingly redundant. Given this, it’s perhaps no surprise that Amazon decided over the summer that – at the end of October – it would shut down the Lovefilm By Post DVD rental service. The concept of having DVDs posted to you might seem as antiquated as picking up a film to watch on the High Street as you head home on a wet winter’s night. However, across the pond, Netflix still ships DVDs to over 4 million subscribers in the US. They obviously believe there’s life in that format for a little while longer. 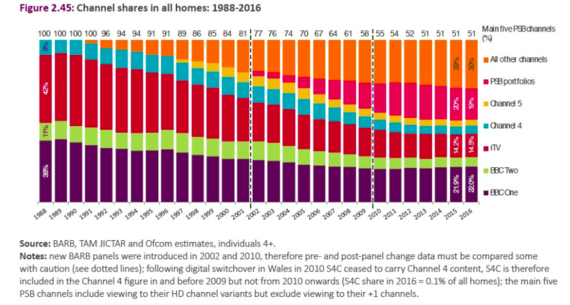 Image source: Ofcom press releaseOur TV habits may be changing, with many of us increasingly watching content online, on portable devices and via on-demand catch-up services, but our love of the TV medium shows no signs of abating. We’re still watching plenty of TV, and with good reason (there’s more quality shows on the box than any of us have time to watch). We’re just doing it differently.